Skye who is now 6 years old is our wonderful happy little black n tan girl who just loves to strut her stuff in the show ring. She captures many a judges heart with her happy dissposition and wagging tail. Skye has like Clancy only had a limited show career although she has done us proud with her excellent wins. At the Metropolitan Kennel Club of WA (Inc)30/31.7.05 Champ show Skye won Best Exhibit in Group. She won Best Intermediate in Show at the 9th Dachshund National held in Perth 2006. Her daughter Annaric Pride of Erin sired by Ch Annaric Clancy also won the junior class at the National. 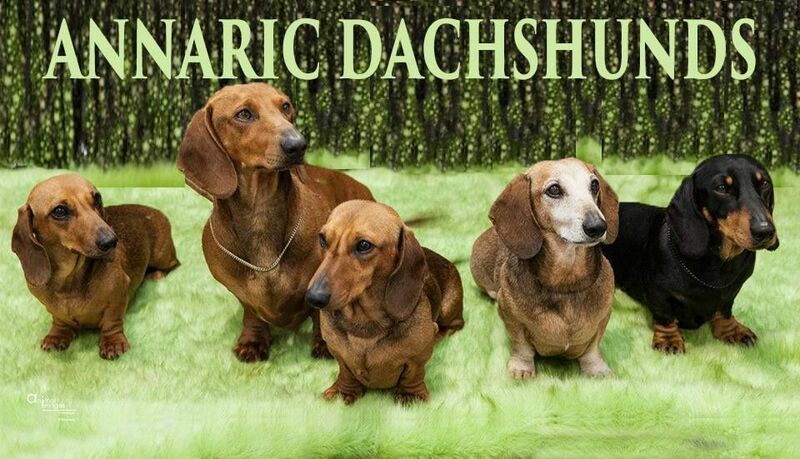 So her qualities have shown through her daughter who is with Vicki Pettigrove of Sarsica Dachshunds Vic. Skye has many wins to her credit and has a wonderful happy temperament and wins hearts where ever she goes. She has a lightening flash tongue which she uses like a little ear, nose and throat specialist and we love her to bits. Her last litter she produced our beautiful little black n tan boy Annaric Chance Specialty "Jasper". Her daughter Ch Annaric The Sea Mystery from a previous litter was titled at 15th months with BOB awarded to her by Mr Wolfgang Schnitzer at the DCWA 2009 Championship show.